Retractable Parking Stand: Keeps the frame off the ground and makes hook-up easier. 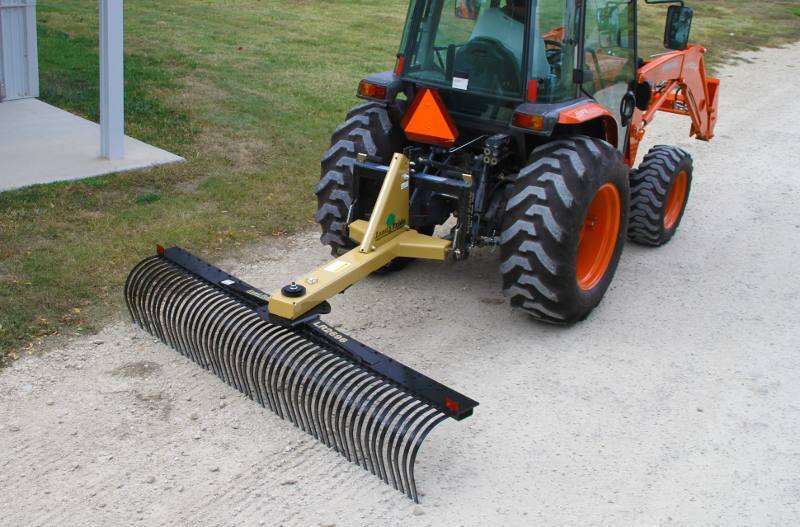 16 1/2” Rake height: Can move a great deal of material. Rake teeth support channel: Design with channel support. This design supports the rake teeth better than competitor models. Prevents teeth entanglement and keeps attachment hardware from working loose. 5/16’ x 1" High carbon spring steel teeth: Sized to eliminates premature bending and tooth breakage. Constructed of materials that have “memory” to spring back to shape. Individual Replaceable teeth: Makes replacing a damaged tooth quick and easy without removing all of the teeth. 7 Angle positions: Versatility in operation. Vary how much material to move. 60", 72", 84", 96" Working Widths: Meets a wide range of customer needs. LR16 Series: 20-40 Tractor HP Range and LR26 Series: 25-60 Tractor HP Range: Fits many tractors with a Cat. l 3-Point hitch. 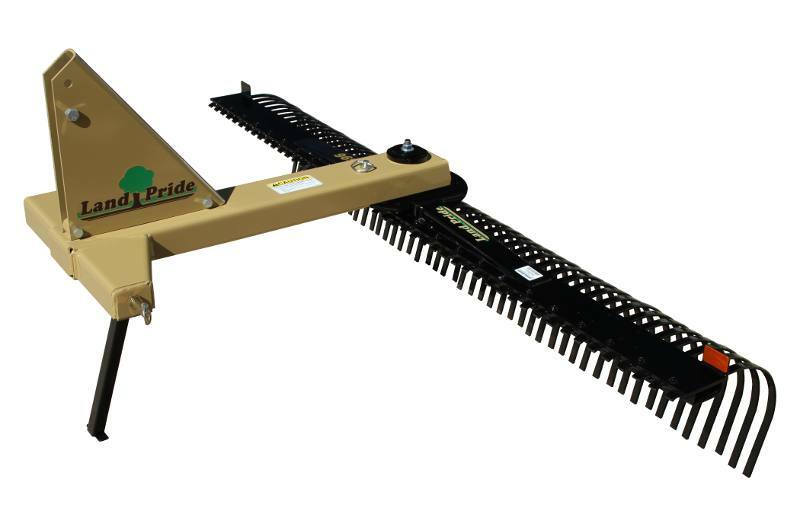 Quick Hitch Adaptable: Fits Land Pride Quick Hitch for a quick and easy one person hook-up. Pivot Tube Diameter: 3 1/2 in. Rake Height: 16 1/2 in. Dual Gauge Wheels (Accessory): Dual Narrow Width Wheels 13 in. x 4 in. x 6 in. or Dual Wide Width Wheels 13 in. x 6.5 in. x 6 in. Dual gauge wheels are capable of supporting Flip Down Grader Blade Accessory.